Al Bigley is the absolute champion of art contributors to the old paper-based Comics Career Newsletter. He drew more covers and provided more spot illustrations than any other artist — by far. 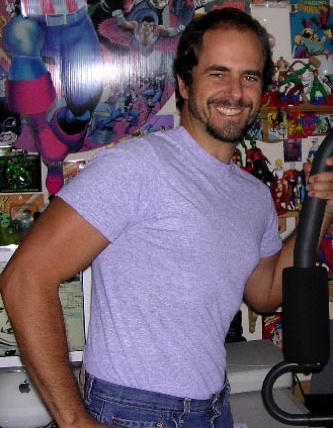 Since his days submitting illustrations to CCN, he’s gone on to a diverse career, drawing comics for DC, Marvel, Archie, Image, Golden Books, Hershey, Kenner, CTW, Disney, and more. He’s also written a new book, Draw Comics Like a Pro: Techniques for Creating Dynamic Characters, Scenes, and Stories , published by Watson/Guptill. You can find out more about this North Carolia artist at his website, www. albigley.com. Around age 7 or so, when I fell in love with comics and drawing. My mom, who had no problem with a kid who loved comics — then seen as sorta “bubblegum for the mind” — and encouraged that hobby and love of drawing. No single person or creator. I love the work of Kirby, Neal Adams, the Buscemas, Nick Cardy, etc. I also tried to absorb any industry info from them I could via interviews or live appearances. I do other creative things: make a model kit, play with music software, or watch a film. I also work out and jog a few times a week. Nothing typical, as freelancers work when they can, but I often just try to work in the morning, returning later to the work if I need to. The usual. Bristol board, pencils, various ink pens and brush pens, erasers, drafting table, t-square, ellipse templates, etc. I also have an iMac for scanning and Photoshop for some fixes or whatnot there. I just like the creation of it. When all is going right, it can be very satisfying. It can also be nice when you see the finished, published product. Not always, though. Very nice feeling to know you’ve gotten through to a young artist. Just don’t be shy about showing your work and getting honest critiques on it. Even if no work comes from that, you’ve gained some valuable insight and advice on the work. Also, many newcomers need to look at artwork other than their favorite stuff by their favorite artists. Even if the industry seems to be buying only that stuff right now, you’ll gain from studying other styles and genres.